Tom’s passion for Excellence is contagious. Once you’ve had a taste, you’re eager to see Excellence emerge in your own work, in your own organization. What can you do right now? If you’ve identified a problem area and want to explore what Tom advises, check out our Multimedia Collections, a trove of his most distinctive work by subject matter. If you need help specifically tailored to meet your needs, contact the Tom Peters Company, which offers diagnostic tools, practical advice, development events, and coaching to advance your improvement efforts. If you’re looking for inspiration from thought leaders whose work piqued his curiosity, read a few of Tom’s Cool Friends interviews. When you want Excellence right now, in your own work life, where do you start? Discover solutions on six of Tom’s most popular topics in this carefully selected trove. Need help navigating or accelerating your pursuit of Excellence? 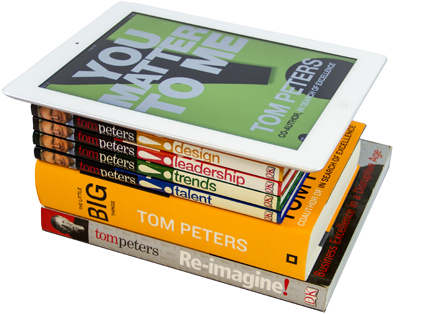 The Tom Peters Company offers a range of powerful tools and techniques for clients who are determined to put Tom’s ideas on Excellence into practice. Tom loves spreading ideas. He asked colleagues to interview business thinkers, authors, and others who have captured his attention. The subject matter is quite diverse. We hope you find nuggets of helpful insight. Tom’s books and ebooks examine all aspects of Excellence. Find out more in Writing.